PDF is both a Visual Integrity input and an output format. Developed and released by Adobe Systems in 1993, Portable Document Format (PDF) is the defacto, worldwide standard for capturing, reviewing and exchanging information from almost any application or computer system and sharing it with others. Although sometimes sharing is enough, often people need to extract useful data from their PDF files in order to feed content managements systems, publish to the web or edit drawings and illustrations. Visual Integrity has been offering reliable and accurate solutions to convert, create, merge and modify PDF files for more than 17 years. To edit PDF drawings in Visio, you can choose between Insert PDF, a handy Visio add-in, or one of our desktop programs, pdf2picture or PDF FLY. The desktop apps will give you more advanced control over conversion options while Insert PDF will quickly open the PDF file, ready to edit, right on a Visio page. 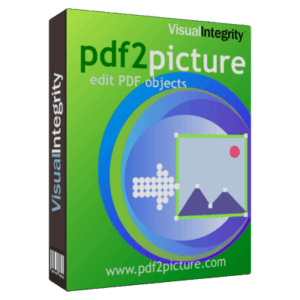 Both pdf2picture and PDF FLY can create files that Visio can import using the native Windows vector graphic format (WMF). It’s also possible for Visio to open DXF and SVG files generated by Visual Integrity’s programs although we find that WMF yields the best results in most instances. Steps for using PDF in Visio. Perform the following steps for using PDF in Visio. Screenshots are based on pdf2picture. Skip Step 1 if using the Insert PDF add-in. Choose Open, File and then select File Type: Windows Metafile from the drop-down menu. It’s the last choice at the bottom of the “File Types” drop-down. Once you see your file on-screen, you are ready to move to Step #2. 2. You should now see the converted drawing on your screen. Important! The drawing is imported as one grouped object and needs to be ungrouped if you wish to edit, remove or add parts of the drawing. To Ungroup your drawing, right-click and select Grouping, Ungroup. 3. When ungrouped, Visio will highlight every individual object in pink. In order to deselect everything, you need to click anywhere on the page outside of the drawing boundaries. 4. Once the drawing is ungrouped and the objects are deselected, you may select whatever you want to change and it will appear with editing handles. TIP! If you want to scale the drawing, make sure you “regroup” it by selecting Grouping, Group so that everything is scaled proportionately. Contact Us if you have problems. The best way to get help is to send the file you are having trouble with along with any comments to support@visual-integrity.com. We’re happy to help! Why should I choose your PDF output over all the others out there? Visual Integrity is well know for turning PDF into other formats but our software is also an excellent choice for creating PDF files. Unlike other technologies which use printer-drivers as an intermediate step to create their PDF-files, we have developed core technology which generates the PDF-file directly from within our engine. This leads to a faster, more accurate conversion. Category: Developers, PDF, QA, Which Product? How can I tell if my PDF file is a vector or a bitmap? As easy way to see if your PDF file contains vector or bitmap content is to magnify the drawing to more than 800%. If you see smooth curves and straight lines, it’s a vector file and the conversion results will be successful. If what you see on screen looks jagged, ragged or pixelated, it is a bitmap file and you will only be able to create a drawing template to aid in redrawing the file in your engineering application. 290 people found this helpful. Category: PDF, PDF & Microsoft Office, PDF FLY, pdf2cad, pdf2image, pdf2picture, QA, Visio, Which Product? Will the software convert any PDF file that I throw at it? 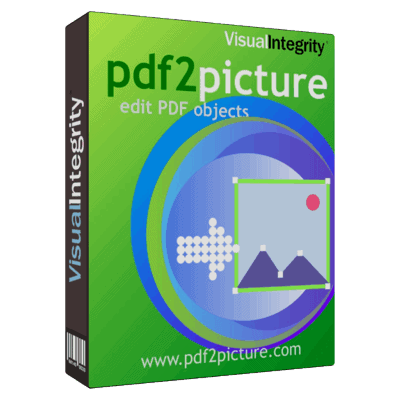 Products from Visual Integrity are designed to convert all well-formed PDF files. If a PDF file was created in an application, it should convert successfully in either vector or image mode. However, if a PDF file was created by a scanner and has already been reduced in the process to a flat image, it will only convert in image mode. If you encounter a file that does not convert or returns errors, send it to us so we can troubleshoot it. These problems are most often caused by poorly formed PDF files. Category: PDF, QA, Troubleshooting, Which Product? 62 people found this helpful.